Canada took on the host U.S.A in a border battle at the World Under 18 championship in Fargo tonight. Despite the rising waters in southern Manitoba and in Fargo itself the Urban Plains Centre was flooded with Canadian and American supporters for Friday's semi-final game between last year's champs and the bronze medalists from a year ago, team U.S.A. However the roles have been reversed this time around as it'll be Canada playing for 3rd and the Americans going for Gold after a hard fought 2-1 victory. Future TPS guest blogger Dylan Olsen (Camrose, AJHL) scored what was looking to be the game winner for Canada on a second period power play point shot. Zach Kassian (Peterborough, OHL) ranked 19th in the March ISS report provided a nice screen for Olsen, who is slated 34th, but who should rise after a good tournament when the new rankings come out next week. But the U.S. didn't fade away in the 3rd, using a pair of power plays of their own to tie things and take the lead for good with 7 minutes to play. Jeremey Morin, (U.S. Nat dev team) projected to be a late first round pick tucked in a Cam Fowler (U.S. Nat dev team) rebound to tie things at 1, before Jerry D'Amigo (U.S. Nat dev team) who picked up the other assist on the tying goal, tipped in a Cam Fowler shot for the game winner. Fowler who's not elegible until 2010 proved why he's a projected top 5 pick with a strong game. Canadian goaltender Michael Zador was brilliant stopping 42 of 44 shots the Yanks fired at him. He was especially brilliant in the 3rd when the Americans mounted massive pressure outshooting Canada 21-7. Zador isn't currently listed in the ISS report, but you should be seeing him in the April addition. He's using the U-18 experience much like Jake Allen did a year ago when he posted the best goals against average and save percentage and shot up the rankings to become a second round pick of the St. Louis Blues. Canada will now face Finland in Sunday's bronze medal game while the Americans will take on Russia for Gold. In the WHL tonight, the Calgary Hitmen destroyed Brandon in game one of the Eastern Conference final. Things started out okay for the visiting Brandon Wheat Kings as they trailed only 1-0 after the first period. Then the Hitmen opened fire scoring 6 times in the middle frame on route to a 9-3 thrashing of the Wheat Kigs. 9 Hitmen players had atleast 2 points with defencmean Paul Postma (Atlanta, 7th round 2007) and Kris Foucault (undrafted) both had 3 points. Foucault now has 8 goals in 9 playoff games after scoring just 9 times in the regular season. Oilers 2007 first round pick Alex Plante scored once as well. Game 2 will go Sunday in Calgary, while Kelowna and Vancouver get going Saturday night (8:00 PM MST-SHAW TV). 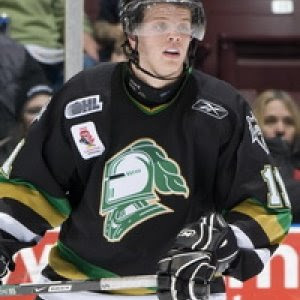 In the OHL London evened their semi-final series with Windsor thanks to a pair of goals from John Tavares and 2 goals and an assist from blueliner John Carlson (Washington 1st round 2008). Phil Varone (undrafted) netted the overtime winner for London. I said from the beginning if London can make this a special teams battle they can win it and the Knights notched 3 power play goals tonight. Game 2 goes Sunday afternoon on Rogers Sportsnet starting at 2 PM MST. The other semi-final seems pretty lopsided right now as Brampton smoked Belleville 7-2 to grab a 2-0 series lead. Evgeni Grachev (New York Rangers 3rd round 2008) scored twice and the Battalion let the big guns loose in the 3rd outshooting the Bulls 17-1. In the Q, Drummondville proved why they were the top ranked Q team in the CHL's top 10. The #3 ranked Voltigeurs anialated Memorial Cup host Rimouski 8-1. Dmitry Kulikov sitting 8th according to ISS had 3 assists for Drummondville who scored just 11 seconds into the game and lead the series 1-0. Quebec doubled up Shawinigan in the other semi-final, which could be seen as an upset, butI picked the Remparts to win the series so it doesn't surprise me. The game was a tight one, tied at 2 heading to the 3rd, before Mikhail Stefanovich (Toronto 4th round 2008) netted the winner 41 seconds into the final frame. Frederick Roy added insurance in a 4-2 victory. 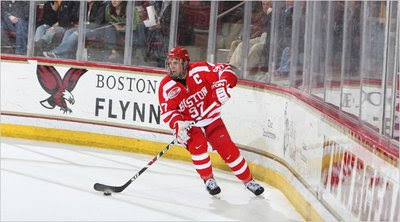 A few other notes, after winning the NCAA national championship, the Boston University Terriers are paying for their success. They already knew senior defenceman Matt Gilroy (TPS guest from March 24th) wasn't coming back and today the Hobey Baker award winner siged a one way, 2 year deal worth $3.5 million with the New York Rangers. BU also saw power forward and Hobey Baker nominee Colin Wilson end his college career after inking an entry level deal with Nashville. The 7th overall pick from last year was expected to leave school this year after a 55 point season in just 43 games. He's physially dominant and when TPS interviewed him before last year's draft seemed very mature. He's a work out freak, and as a bonus grew up in Winnipeg so you know he's a good kid. One final thought, my good friend and collegue at Global Sports John Sexsmith and I were chatting about coaches today and he brought up a interesting name. Boris Rybalka. John is a fan of TPS, so you know he's smart, but in all seriousness he knows how high we are on the Camrose Kodiak coach. John wasn't throwing Rybalka's name out as a replacement for Craig MacTavish, but maybe for an assistant coaching spot with Springfield next year. I'd have to say I agree with him, in fact it's something I've even spoke to Rybalka about in the past.